Sustainability in its three dimensions (environmental, social, and economic) is of the highest importance for Titech Electric. 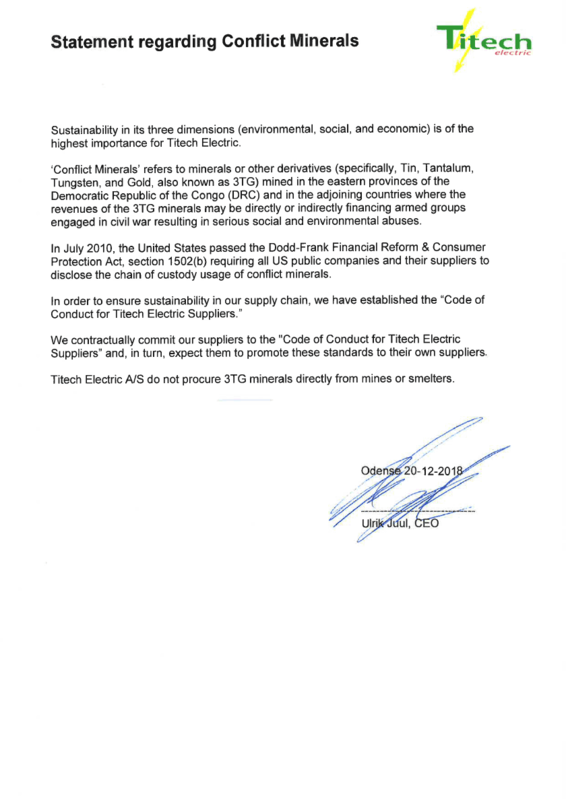 “Conflict Minerals” refers to minerals or other derivatives (specifically, Tin, Tantalum, Tungsten, and Gold, also known as 3TG) mined in the eastern provinces of the Democratic Republic of the Congo (DRC) and in the adjoining countries where the revenues of the 3TG minerals may be directly or indirectly financing armed groups engaged in civil war resulting in serious social and environmental abuses. In July 2010, the United States passed the Dodd-Frank Financial Reform & Consumer Protection Act, section 1502(b) requiring all US public companies and their suppliers to disclose the chain of custody usage of conflict minerals. We contractually commit our suppliers to the “Code of Conduct for Titech Electric Suppliers” and, in turn, expect them to promote these standards to their own suppliers. Titech Electric NS do not procure 3TG minerals directly from mines or smelters.